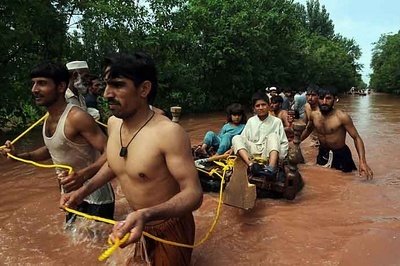 To help the people in Pakistan it is one thing but how you can avoid the corruption is another altogether and days after the inhuman catastrophe that has hit the country nobody knows what is worst, the flood that took thousands of lives all the corruption that will take millions more in the years to come. The first reports coming from the NGOs from Pakistan are devastating, not only the photos and the numbers but the reality that very rarely reaches the headlines and please don’t think that it is only Pakistan, Pakistan is just an example on what’s really going on and the difficulties these NGOs have to deal with. The worst part of it is that the NGOs have often to balance in very thin lines that politics stage. A few weeks ago the Pakistani president and the prime minister were photographed with leaders of the world and Barack Obama appearing as leaders of a country with military power that guarantees the region security and power balance while the truth is that their power is limited in the borders of their palaces and the real rulers of the country – I have to emphasize, a nuclear power country – are the hundreds of warlords who rule the people and the land. This minute in Pakistan there millions that have immediate need for basics including water, basic food and cloths. And there are hundreds of countries and organizations from all around the world that collect and send them the only thing is that they don’t reach the ones who need them but they enrich the ones who have access to them and this is a totally different story. You see all this hep has to go through the hands and the bureaucracy of the local authorities and local authorities means the ultimate corruption, small warlords that use even the international help to increase their power and influence. This reminds me a conversation I had more than a decade ago with a Pakistani scholar about democracy. When I explained how democracy works he reacted a bit angrily saying that like all westerns I don’t understand that Pakistan is not Europe and that democracy is different in these places. To my point that Ghandi had shown how democracy works in the region of the continent he reacted by leaving the room. That’s how he understood democracy but before that he had pointed that bribery for example was part of democracy that we should accept if we wanted things to work in places with so big populations because we need the local ‘maharajas’. These local ‘maharajas’ nowadays have become worst than diseases, they are the cancer that eats countries like Pakistan. They ignore the central government, the laws and institutions establishing their own state, their own laws and their own institutions and the result is obvious now when the water and the food is reaching Pakistan with only difference that the biggest part goes to this local kings, their captains and their followers and the rest can get the leftover with the right value. I’m not joking; a lot of the help becomes items for the local black market. Some people this very minute in Pakistan they are actually become richer and the majority of them are the …local authorities. I suppose you will say and what the UN are doing, the Americans, the EU and the rest who are involved in this race to help the people. I’m afraid that you are missing a small but very important detail. Pakistan is our ally to the war against terror! Politics! And we don’t hurt our allies, we protect them! We need them. And if somebody says anything then we start screaming …national security! Don’t you remember, it is just two and a half decades ago when Saddam was an ally didn’t matter how many Kurds he was exterminating. Musharraf – does anybody remember Pakistan’s dictator? – He was the local democratic symbol and ally in our war against terror. In the meantime people day every minute in Pakistan and the flood will stop one day, next week, next month next year they will corruption that takes far more lives unfortunately will not because democracy is a local issue!